ADATA Technology, a leading manufacturer of high performance DRAM modules, NAND Flash products, and mobile accessories today confirmed that its Premier microSDXC/microSDHC UHS-I Class 10 cards now support the new SD Association A1 standard. Part of SD 5.1 specifications, A1 has been designed for running apps off external storage, going beyond traditional SD card uses such as accessing photos and video. 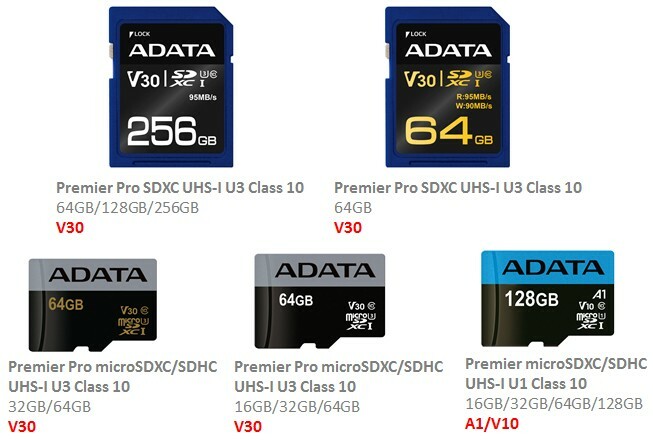 At the same time, ADATA has also implemented V10 and V30 video recording capabilities on all of its Premier Pro microSD and SD cards, denoting at least 10MB/s and 30MB/s of video recording bandwidth, respectively. An evolution long promoted by the SD Association, the A1 specification is part of SD 5.1 requirements. It shows that a microSD or SD card can support sufficiently high read speeds and IOPS counts to successfully run most apps without latency being an issue. In other words, A1 certified microSD and SD cards equal internal storage for app performance. They give users much greater freedom, as before apps were limited to internal storage even if large external storage was installed. With A1 and future specifications, users have the ability to install many more apps than would normally be the case, thanks to large add-in storage that is able to run said apps without compromise. At the same time, all ADATA Premier Pro SD and microSDXC/SDHC cards are now validated for V10 and V30 video recording speed ratings. Although the fastest ADATA cards support V90 speeds (90MB/s pure video recording), ADATA recognizes the demand for sustainable and smooth video capture performance extends across market segments and is not limited to professionals who are willing to pay top prices for the best storage. The rise of 4K video means more users require assured bandwidth dedicated to video capture, and V10 (10MB/s) plus V30 (30MB/s) specifications address those needs. Users are guaranteed these speeds as verified by both ADATA and the SD Association.